No where are laws and legislation a stronger form of social engineering then when it involves the economy and taxation. Tax incentives and the fuzzy math that surrounds them often cloud the issues. Its often not how much money is spent but rather how the money is spent that determines the value of an investment. America’s lack of savings is repeatedly pointed to as a problem, yet laws, that tax interest make small savings accounts a non-starter when coupled with the factors of inflation and bank fees. For a long time I’ve promoted a program that makes the first Two Hundred Dollars of interest from a savings account non-taxable as a way to encourage savings. At a four percent interest rate it would allow for the interest on a Five Thousand Dollar savings account not to be taxed. This change would create a more positive savings environment for those most likely to need a safety net from job layoffs, auto repairs, illness, and other misfortunes. Cost to the Federal Government if the holder of such an account were in the twenty percent tax bracket would be Forty Dollars per year. This is far less than the assistance programs we must put in effect to help when bad things happen to those with no buffer or savings and their financial house collapses. Considering all the complex tax laws and legislation Congress enacts this would be one of the simplest to write and enact. This is an easy to implement alternative to complex schemes like Bush’s Social Security Reform and ownership society plans. Each of those plans would have created huge administrative problems further adding to Governments growth and intrusion into our lives. Footnote; The special breaks and deduction that make up Americas tax code are massively confusing. Most people are totally ignorant of tax law and have no idea what they are talking about when they express an opinion on what policy changes should be made,or how they will effect the economy. The post below looks a little deeper into the subject of taxation. The article I wrote and posted on Mon Dec 24, 2007 remains as relevant today as when I wrote it. The post subject: Candidates shy away from the dreaded "C" word, I find it a shame that none of the Republican Presidential candidates or president Obama tonight in his State Of The Union address have mentioned any real innovative initiative concerning energy conservation. There are many new and exciting ways to recycle and cut energy waste. Public officials seem almost afraid to talk about conserving energy, it is as if they will offend someone or that big business and their lobbyist have made the subject taboo. Maybe they just don't care about America or the planet on which we live. Simply mandating lower heating and higher cooling settings in government offices and buildings would give the private sector the cover they need to adjust their thermostats accordingly in offices and stores. A simple yearly fee on inefficient vehicles paid to the states when licenses are renewed would accomplish much in getting Americans to shed their gas guzzlers and move America to more fuel efficient transportation. Halting the manufacturing of the low end 80% furnaces that are still being installed in many new homes and phasing out the sale of light fixtures and appliances that fail to make good use of our remaining resources are just a few ideas. Each school day millions of buses hit the road across America transporting children to schools across town and past the schools near their home. Every Saturday a massive fleet of vehicles leave post offices across the land to deliver mail that most Americans do not feel is important. The cost of policies like these go far beyond the cost of money being poorly spent, they take a toll on our planet. We need politicians who care about the hidden cost of short term policy and have the courage to focus on long-term planning and sustainability. It is time voters demand politicians put this priority before their desire to serve big business and the lobbyist that shower Washington with money. Innovation does not always involve creating and spending billions of dollars. Innovation means thinking of new ways to get the job done. While it could be argued that cutting back on waste would lower the GDP it would have many positive benefits such as improving our standing in the world community. As we conserve, pollution is reduced , America's economy will be strengthened by reducing the importation of energy, new jobs will be generated by the industries that address these needs, and damage to the climate from global warming lessened.. Why are politicians so willing and eager to ask Americas sons and daughters to risk life and limbs in foreign wars while unwilling to ask Americans to make such a minor sacrifice? Footnote; on April 12, 2012 I posted what turned out to be one of the most popular post I have ever written, it deals with how each of us impacts this planet we call home. If you are interested please take a look. Footnote #2; They have finally stopped producing some of the least efficient furnaces and lighting. Only 2% of all Americans employ all of the private sector employees! 98% of Americans do not risk capital, or try to meet a payroll. These people buy health insurance for their workers, try to create and innovate, often lease an attractive site, maintain business licenses, observe myriad obscure regulations, compete with cutthroat competitors, and busy themselves with trying to meet disability access standards. It is not uncommon for them to also remain on call 24/7 for any business emergencies, and stay up late into the night trying to juggle interests of employees, business and community. America is the greatest and richest capitalistic society in the world, yet we should note that our entrepreneur class that is surprisingly small and shallow. According to the Small Business Administration only 10% of Americans own a business and 80% of these are single self employed businesses. This means only 2% of all Americans actually employ at least one non-relative employee. Few businesses are large conglomerates like Walmart or McDonald's with hundreds of thousands of employees, some are mediums size, but by far most are small companies with under 50 employees. The other 98% of Americans busy themselves with demanding jobs with higher than average wages, a full complement of generous benefits and frequent paid holidays. Most seek a definite work day without after hour calls. America is not so much a capitalist society as a worker's society demanding socialist protections, this is why workers are not getting any job offers. The solution to unemployment is more entrepreneurship, if only 2% of Americans decided to start a business and hire at least one employee America would double the rate of entrepreneurship and capitalism! The sad truth is beyond the Lemonade Stand of childhood, few Americans know anything about running a business. Running a business in America is complex and requires knowledge and smarts, Government must encourage business formation by slashing through the regulations and roadblocks that make it more difficult. There is another source for these rare entrepreneurs: Immigrants. Immigrants have more than ten times the rates of business start ups than the natives. In certain communities, it is even higher such as the Jewish/ Israeli, Lebanese, Indian and Chinese communities. Immigration policy should promote bringing these rare capitalists to our shores; they are more essential to America than Olympic athletes. Very few Americans have the guts to risk entrepreneurship, they are the few that make America great. They think differently, they take risk, and they problem solve. America must find these souls and promote them and enable them. It is risky, hard work, and exhausting, but it may be the only long term solution to the Great Recession. It is the 2% that carry 98% of the Capitalist Economy. Footnote; Thanks for reading, your comments are appreciated. For more on small business see the article below. The Penny Doesn't Make Sense! Coins are designed by the government to be a simple and efficient medium for the exchange of goods and services. For many years there has been discussions about discontinuing the penny which has become obsolete because of its minuscule purchasing value. The debate against continuing the penny is overwhelming, anyone still supporting it most likely has not given the subject much thought or is simply resistant to change, “the penny doesn't make sense". Not only does the government plan to continue making the penny it issued four new versions in 2009. It is not the job of the well paid employees of the treasury to create collectibles or to pander to small segments of the population by designing coins commemorating or recognizing minor events. At a time that America is reviewing its environmental policies we could also attack the penny for all the energy used to make, transport, and distribute this useless coin. The penny is a perfect example of our governments inefficiency and waste, and the cost is a burden carried by business. If an employee is paid $12.00 an hour they receive twenty cents per minute. Business simply cannot afford to pay an employee to handle and count pennies, the cost of the labor exceeds their value. According to the “citizens to retire the penny” it cost the Country one hundred million dollars a year to produce the penny, and more then $15 billion dollars annually is wasted just in handling cost. Think of the good this savings could effect. Small things matter, if our politicians can’t get this right how can they ever deal with important issues like health care . A nickel for your thoughts, how do we bring the penny to a end? Don’t expect the government to do the right thing in a land and world so self-centered, indifferent, and focused on pandering to those who fear change. We need creative ideas to highlight this stupidity and bring about the penny’s final demise. For example, a countrywide movement and intense effort with lots of hoopla on the part of those intent on the pennies demise, it could involving and removing huge quantities of the penny from circulation all at the same time. I'm open to other suggestions. What can one say about the big blow out win that Newt achieved last night in South Carolina? Much of the recent volitility in the recent Republican primaries can be attributed to the media making a candidate into the "flavor of the day" then crushing that person on a whim. Candidates rise like shooting stars to be proclaimed our salvation then fall back to Earth just as quickly. How many times can the main stream media ignore Ron Paul? All this is part of the game as the media tells us what to think. Many Americans appear to have become tired of this constant spin. Yes, this is the same media game that gave America George W. Bush and Barack Obama. Fortunately "live broadcast" over the internet and air waves are effecting the way we interpret events. Much like the messages between people did during the Arab Spring these broadcasts could be called "green shoots" of freedom. The huge number of live televised debates is making it more difficult for the pundents and media to control opinion during this political season. Newt has seized on the anger directed towards the media and establishment as a result of their constant and unending manipulation of reality and facts. The people are pissed off, yes the tea party, yes the occupy wall street, and yes these asked to pay for a Government that is too big, too expensive, too ineffective and out of touch. During the 2012 Republican Presidential primary debate in Myrtle Beach, South Carolina a black panelist asked Mr. Gingrich if he could perhaps see how certain comments he has made in the past might give special offense to black Americans. In response to Mr Williams' quixotic second attempt to coax the former speaker of the House into acknowledging that insistently calling Barack Obama "the food-stamp president" smacks of racial politics, Mr. Gingrich rejoined: "First of all, Juan, more people have been put on food stamps by Barack Obama than any president in history." This claim sent the crowd into an ecstasy of delight. "I know among the politically correct you're not supposed to use facts that are uncomfortable", Mr. Gingrich added. Defenders of Barack Obama say he has put no one on food stamps and blame what has happened on population growth together with the most severe recession since the advent of the modern American welfare state, which was in full swing when Mr. Obama came into office. Over the years our government has created program after program to help the poor, one upon another, these programs often they overlap. Many see this as a safety net that has succeeded in keeping millions of Americans from being forced to endure the misery of hunger. 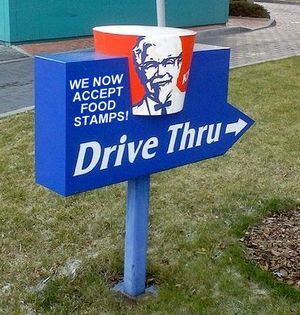 The fact is that the food stamp program has grown a great deal, to pin the label "food-stamp president" as "politically incorrect" or "racial' is as much of a reach as to not acknowledge this. The real issue is that regardless of how people feel about Government programs we are currently facing a massive Federal deficit and that the food stamp program also known as SNAP should be reformed. The food purchased with food stamps should be limited to "only" approved basic and healthy foods like milk, eggs, potatoes, rice, chicken, and generic brands of peanut-butter, ice cream, and bread. Off the list should be premium and luxury items such as T-bone steak, and all the high priced frozen items and snack foods that fill America's grocery stores. An example of where they should not be allowed is at the gas station-convenience store near my home where they can be used to purchase pop, cookies or a sandwich. It should be made clear that those on the program and the people that need help are not the only supporters of this program. A case could be made that the biggest beneficiaries of the food stamp program are grocery stores and the food industry, this includes companies that make everything from breakfast cereals to dinner rolls. If major cuts are made to this program their margins would be squeezed and profits suffer. They are quick to make the claim that they would have to cut back and this could put more people out of work which would hurt the economy. Still, this program is getting out of control, a recent report indicated that an average of 46.6 million people used the program in 2012, up from 26.3 million in 2007, a 177% increase. I live in the State of Indiana where those on food stamps are given an "Indiana Works" card that looks like a credit card. This card is to spare recipients much of the embarrassment of receiving aid or being on the dole. Many Americans are appalled at the mix of high priced and unhealthy foods our tax dollars are used to buy through this program. People buy these foods to fulfill their "appetite", it has gone far beyond just keeping people from going hungry. It is one thing to let people starve, but how do you justify qualifying someone on government assistance to be able to purchase items that hard working taxpayers often feel unable to afford? Footnote; This post dovetails with many of my recent writings, for more I might suggest reading the article below. Other related articles may be found in my blog archive, thanks for reading, your comments are encouraged. More about the rapidly expanding SSI program in the article below. It has been said that money is the mother’s milk of politics, this in many ways has been the Achilles heal of small business. The lobbyist that represent banks, big business and special interest have had their way to the detriment of America and small business. They have shaped and crafted regulation that has shifted commerce strongly in their favor. As the stocks of large companies rise we are often oblivious to the names of local businesses that cease to exist. Small business, with two to ten employees, are becoming an endangered species in America. The family business once the backbone of this country is under attack from the unintended consequences of the laws passed in recent years. Inspections, a plethora of permits, licenses, taxes, insurance requirements, and regulations make it almost impossible for a small business to open and operate legally. Sadly as this is happening the country no longer is seeing children learning valuable skills as they grow up in an environment where the whole family pitches in to build a future and better the community. Owners of small businesses are burdened with spending countless hours trying to comply with government mandated red tape rather than in earning a living. A fact that often goes unnoticed and is usually denied by government employees is that jobs in Government often pay better and are less demanding then those in private business. The government also provides better job security and many benefits the private sector can’t match. This is a strong incentive for people not to take the risk of starting their own business. The question of whether bigger is better has often been debated as Wal-Mart expanded across the land. The advantage of size allows for whole departments to specialize in dealing with Government regulations that have become the bane of the small businessman. Even as many small businesses try to carve out a niche they can defend against the giant retailers down the street they must also compete against exploiters like Amazon that have no brick and mortar presence in the community and often avoid cost such as local and state sales tax. While efficient in distributing goods these behemoths diminish cultural diversity and alter the fabric of society. The jobs they offer neither fulfill or excite, few people grow up filled with desire to work at a big box store like Wal-Mart or in a Amazon warehouse. My point; a special effort must be made to simplify and lessen the regulatory burden on small business if we want to continue creating new jobs. This is the best hope for America to remain a land of opportunity and to give our children options as to what kind of life they might choose to live. This was a post that I wrote several years ago; it still holds true today. In many ways it is far worse, yes it is still lingering! Now for the post............. Its not just delinquent subprime loans that are creating havoc with America’s economy, the crux of the problem facing us today lies in the real value of assets these loans represent. The factor that many people fail to consider is the dreadful carrying charges that Real Estate generates as it sits in a sour state, often vacant it tends to receive little or no maintenance and it spoils like a basket of fruit growing worse by the day. Legal costs, taxes, insurance and an illiquid market for dilapidated real estate needing expensive repairs mean this problem will linger and effect the market for several years. Many more large write-offs are forthcoming. America’s depression in the 1930's was greatly the result of a liquidity crisis, history shows the economy seized up like an engine deprived of oil. Lessons long learned have put the Fed and World Central Banks out front in preventing this problem today. A better analogy as to the quagmire before us is Japan’s economy from the1980's forward. Even zero percent interest rates have failed to push their economy back onto the track of solid growth. The type of economic trauma we are currently experiencing is often deflationary, in this case stagflation may be created by flooding the market with money to mask and minimize the pain caused by values of assets dropping while loans on those asset remain constant. Disinflation, stagflation, and inflation all result in a “transference of wealth” to those invested to benefit from these unique trends which can be manipulated by the banking system. World and economic trends are formed by many factors . The “velocity” of money as it moves faster across markets aided by electronic transfers has added to the money growth, the gross national product, and the creation of what I see as the first Global Bubble. Those who see China as unbreakable may need to look deeper past their own reflection and they will see a country with huge problems, an economy based on corruption, weak banks, and an over valued stock market. A huge population does not make a country rich, we have drank the Kool-Aid and bought this myth! I would not be surprised to see China become unhinged in much the same way the Soviet Union did at the end of the cold war. It appears that many investors are viewing this pull back as a buying opportunity. Trying to catch a falling knife and picking a bottom in this market are both very dangerous. My views are based on several years of research and are the basis for opinions I presented in my recent book.. I have reviewed this research and stand by my view that Americans have a hard road before them as they adjust to the realities of our fast changing world. $80,000 A Word Is Not A Bargain! I never thought that I would be posting a blog to this site about the new $120,000,000 Martin Luther King Jr Memorial in Washington D.C. It seems that the memorial is already embroiled in controversy. The scheduled inauguration on Aug. 28, 2011 was interrupted by Hurricane Irene. Then, poet Maya Angelou objected to an inscription which reads: "I was a drum major for justice, peace and righteousness." The problem is that The King Family charges $80,000 per word to use his pronouncements. So the extended quote would cost another $2,000,000 in taxpayer money. Ed Jackson, the executive architect for the project says the quotation won’t be changed, despite the criticism that it makes MLK sound arrogant. It is possible that many people recently have started referring to Martin Luther King Jr. as MLK because of this. When it comes to a project like this it seems it is is all about money. Just how much a word would it cost to make everybody happy? I had a dream that Washington would someday get something right, that hope has been dashed yet once again. This posting takes the pressure off, any thought that every post has to be earth shatering or incredibly deep.